I don't know about you, but my hair is one area that seems to get a little neglected. 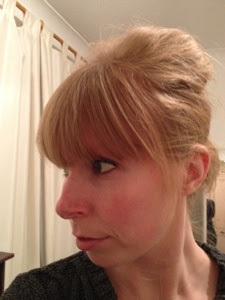 It gets treated to masks, oils and all sorts, but when it comes to styling and up dos, I can just about manage a bun (and that's with a bun ring!). 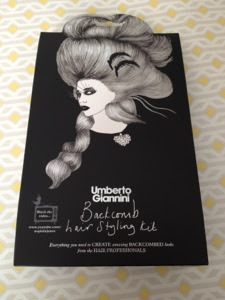 The new Umberto Giannini hair kits are designed to make creating beautiful up dos a little easier, by containing all of the things you need to create a look in one box. The backcomb kit enables you to create lots of different backcombed styles, but offers instructions for a large backcombed bun look, reminiscent of the 1700s. Unfortunately my shoulder length hair was a little too short to create this successfully, so I decided to create a beehive instead. Inside the kit you get: a back-coming brush, two types of hair grips, no snag elastic bands, a large donut style sponge ring (this clips together) and a smaller sausage shape sponge. 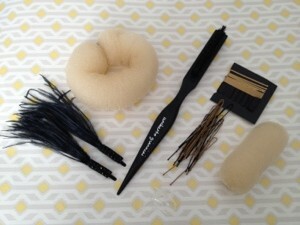 You also get two decorative hair clips with feathers on to embellish your finished look. 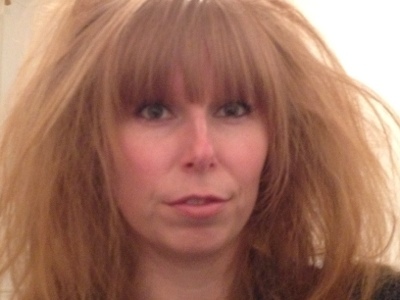 The back-combing brush was really good and quickly teased my fine hair. 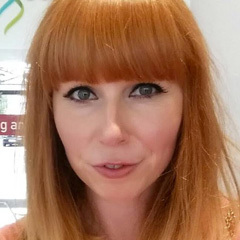 After backcombing all over, I gripped in the smaller sausage shape sponge at the back of my crown, keeping plenty of hair to comb over it to create the beehive. After lots of gripping and smoothing, I managed to get a cute little beehive! The kit is really easy to use and I like the fact that you get all the tools you need to create the featured look. The only thing I think that could've been included was a small can of hairspray to help keep it all in place. The kits retail for £12 and can be found in larger Boots stores. As well as the backcombing kit, there are also 'up do', 'vintage' and 'festival' styling kits to choose from. These kits sound like a really good idea and I love your beehive! Whenever I've tried it myself (without all this paraphernalia) it's been so hit and miss, but I love the idea of everything all in one kit. Great review!